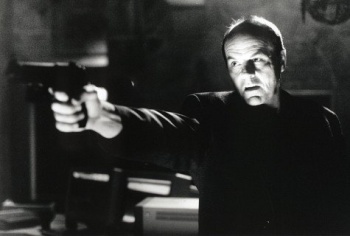 Michael Ironside, famous to gamers as the voice of Splinter Cell's Sam Fisher, admitted last week that he's never actually liked the role because there's too much violence and only agreed to stick with it because Ubisoft kept throwing money at him. One of my favorite moments in gaming came several years ago, not the result of some red-hot action sequence or great strategic victory, but through a brief conversation NSA agent Sam Fisher had with a fellow videogame character. "I'm going ask you some questions," Fisher said. "When I think you're lying, I'll do this." And then, to illustrate, he did that, making his unlucky adversary squeal like a stuck little piggy. It was great stuff, thanks in no small part to Fisher's low, menacing growl, provided by Canadian actor Michael Ironside. He's made a long career playing dangerous, violent tough guys in film and on television, but to gamers it's his voice work in the Splinter Cell games that really rings a bell. Yet Ironside, a self-described "pacifist," claimed last week that after he signed the deal to do the first game - and his wife bought a new SUV with the money - he was "shocked" by the script and came dangerously close to turning it down. "I didn't want to do it. It was too violent," he said. "I was ready to return the SUV and give the money back. I was as ignorant of games as you can be when I got that first script. I really did think it was like Pong." He said Ubisoft agreed to make some changes to "humanize" Fisher that made him more comfortable in the role, but admitted that things got worse as the series progressed. By the time Splinter Cell: Double Agent rolled around, he was just holding his nose and signing his checks. "I got sucked back in," he said. "They gave me too much money. How dare they?" Ironside was interested in the upcoming Splinter Cell: Conviction, however, because it sees Fisher breaking away from the military organization he was previously beholden to. "Sam ended up representing a sociopathic and sometimes pathologically lying organization in the third and fourth games. It was sad. Sam was just sitting there thinking, 'I'm a gun in the hand of an irresponsible entity.' I didn't want to go any further with that," he said. "Now we're going to where he's going to try and hold those entities responsible for their actions." I would guess that "holding them responsible" probably means a whole lot of doing this. Splinter Cell: Conviction is set for release on April 13 for the Xbox 360 and April 27 for the PC.